The second Kazal Kinderpitch was inaugrauated in Albania this year, after Elbasan, this time in Shkodër. The new Kinderptich was implemented in the Ismet Sali Brucaj Kindergarten and was officially opened last Thursday. The ceremonial event was attended by the Chairman of the Albanian Football Federation sponsoring the investment, Armand Duka, the Ambassador of Hungary, Lóránt Balla, legendary Albanian footballer and Founder of the LC5 Foundation, Lorik Cana and Chairwoman of the Kindergarten-Sport Public Benefit Foundation, Andea Molnár JD. 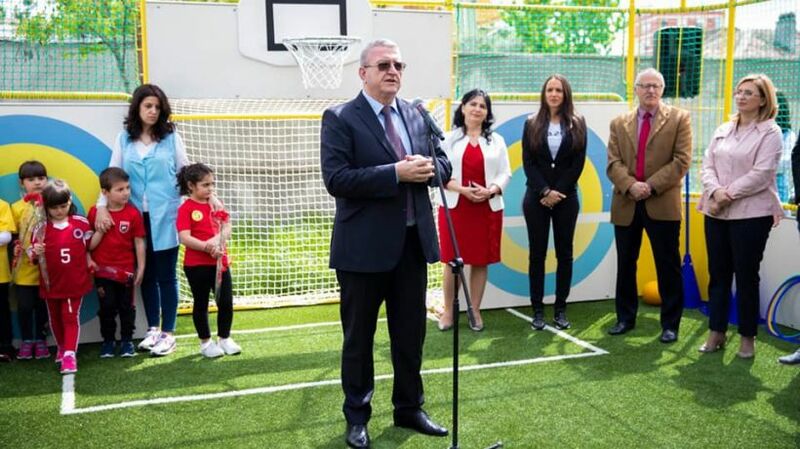 "This Kazal Kinderpitch and the related educational, kindergarten teacher training program is an investment in Albanian youth," President Mr. Duka said. Lorik Cana explained that Shkodra is close to his heart and that his goal is to involve 1000 Albanian children by the end of the year in the Kindergarten-Sport Program. "I hope that this unique Hungarian innovation can contribute to finding the great Albanian football players of the future," Ambassador of Hungary, Mr. Balla added at the ceremony.